Paul Cézanne, Le Lac d'Annecy (Lake Annecy) (1896) (R805), oil on canvas, 65 x 81 cm, The Courtauld Gallery, London (Samuel Courtauld Trust) (P.1932.SC.60). Wikimedia Commons. I mentioned in the first article in this series that it was not only Turner but Cézanne who appeared to show discrepancies in the reflections they depicted in paintings. Having established what principles should be maintained in ‘accurate’ paintings of reflections on water, I turn now to three examples selected from Cézanne’s work. This is one of Cézanne’s best-known paintings, which has been reproduced and discussed extensively. It shows a view across Lake Annecy from Talloires, featuring the distinctive Château de Duingt and the foothills which rise behind it. The water surface is shown to cover almost the entire lower half of the painting, within which the reflections of the castle are central and dominant features. Comparison with views of the actual motif reveals that Cézanne has brought the far shore considerably closer to the viewer than it really is, by enlarging all the objects on that shore. House (2008) stated that the château is about one mile away from Cézanne’s viewpoint, but measurement on modern satellite images shows the distance to be 0.76 km or just under half a mile. Although some have questioned whether the lake surface is ever calm enough to permit such clear reflections, there is photographic evidence that, on occasion, the reflections can be as clear as those depicted here. However neither that nor optical principles suggest that the reflections could possibly appear the way that Cézanne has painted them. Assessment of four objects reveals that the reflections shown are in reasonable alignment with their original images; two of the assessments found no lateral displacement at all, the other two finding shifts of approximately 3 mm. 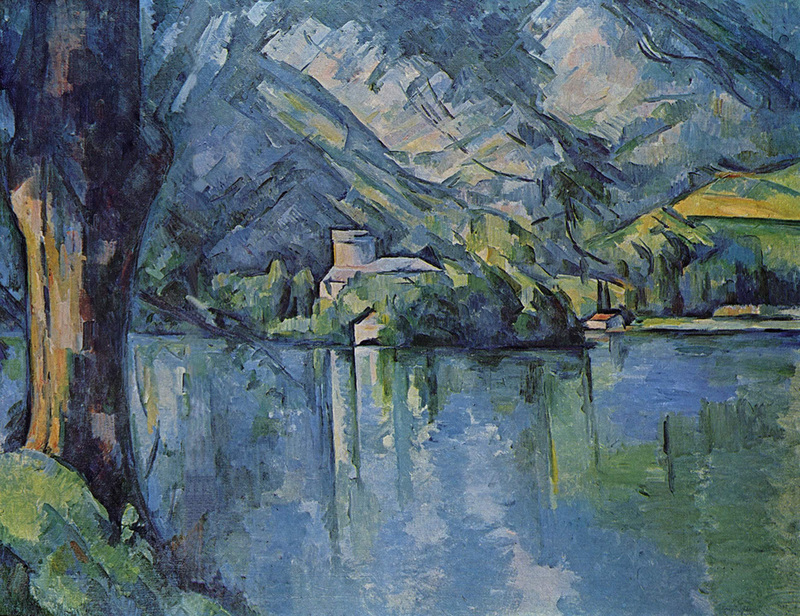 Paul Cézanne, Le Lac d’Annecy (Lake Annecy) (1896) (R805), oil on canvas, 65 x 81 cm, The Courtauld Gallery, London (Samuel Courtauld Trust) (P.1932.SC.60). Wikimedia Commons. Composite image to show discrepancies in reflections. As revealed in the composite image above, immediately to the right of the tree trunk shown marking most of the left in repoussoir, the water surface is depicted as being pale blue, with two light vertical marks which should represent reflections, although the area being reflected is shown much darker in the original image and lacks any object corresponding to the vertical marks. Moving right across the reflection, there should then be a green area to match the original greenery shown on the left of the château, but the water surface there remains a mid blue. Although the original image of the castle closely resembles photographs, the reflection shown appears to be that of a quite different object, consisting of two tall, slightly slanting, pale cylinders, neither of which is aligned with the edge or tower shown. The original image of the castle is shown to be dark green-blue towards its right, which is not matched in the reflection. In the middle of the lower part of the lake various light patches of paint do not appear to match any corresponding light areas in the original image above, where light patches are placed diagonally, rising to the left of the painting. The right edge of the promontory on which the castle is situated also differs beween the original and reflection, and two vertical green marks in the reflection straddle a higher dark green mass in the original. The far right section of the shore, set further back, has reflections which differ from the original image too: although the red-roofed building is depicted in reflection, the reflection shown of the shoreline appears much darker than the bright original. These substantial and prominent differences between the original and reflected images are hard to explain, and this is a deeply enigmatic painting. This is in spite of the facts that the water surface is seen to cover almost half the painting, and reflections are shown over a substantial proportion of that surface, prominently in the centre of the canvas. Cézanne’s later works are known to depart in various respects from his earlier paintings and those of his contemporaries, and it is widely held that these departures heralded some of the great changes that took place in painting during the twentieth century. However, unlike his treatment of colour or perspective, his unconventional treatment of reflections on water is obvious in much earlier work, including Paysage des Bords de l’Oise (1873-4) and Le Bassin du Jas de Bouffan en Hiver (1878), probably dating from 18-23 years before Le Lac d’Annecy. Paul Cézanne, Paysage des Bords de l’Oise (Landscape on the Banks of the Oise) (1873-4) (R224), oil on canvas, 73.5 x 93 cm, Palais Princier, Monaco. WikiArt. This is an Impressionist view from Cézanne’s first campaign along the River Oise, when he painted in company with Pissarro, and shows the northern bank near the hamlet of Valhermeil. Paul Cézanne, Paysage des Bords de l’Oise (Landscape on the Banks of the Oise) (1873-4) (R224), oil on canvas, 73.5 x 93 cm, Palais Princier, Monaco. WikiArt. Composite image to show discrepancies in reflections. Although reflections only appear in a narrow band at the foot of the picture, that depicting the house with a red roof is particularly prominent, and visibly out of alignment with its original. The measured lateral displacement in the reflected image of that house ranges from 27 to 39 mm, depending on which part of the house is assessed. Those represent 2.9% to 4.2% of the total width of the painting. There are 4 other displacements ranging from 10 to 17 mm. All the displacements seen are of the reflection to the the right of the position expected according to optical principles, as shown. Although the view shown does not make it clear, at this point even in Cézanne’s day the River Oise was not just a few metres wide, but was and remains a wide, navigable waterway. Whilst it is possible that Cézanne painted this view from a boat moored close to the northern shore, there are no records to even suggest that he or Pissarro painted from a boat at that time, and no other canvases from that period suggest that they were painted from a boat. 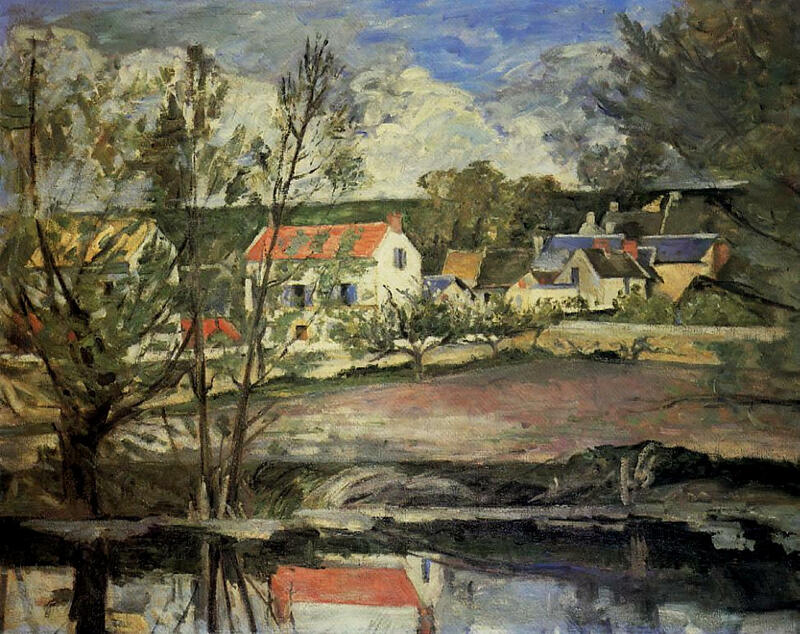 It is thus most probable that Cézanne painted this from the southern bank of the Oise, at least 70 m away from the depicted reflections. Measurements made from recent satellite imagery and compared with maps of the time show that the house with the red roof was approximately 70 m and no less than 50 m from the water’s edge. 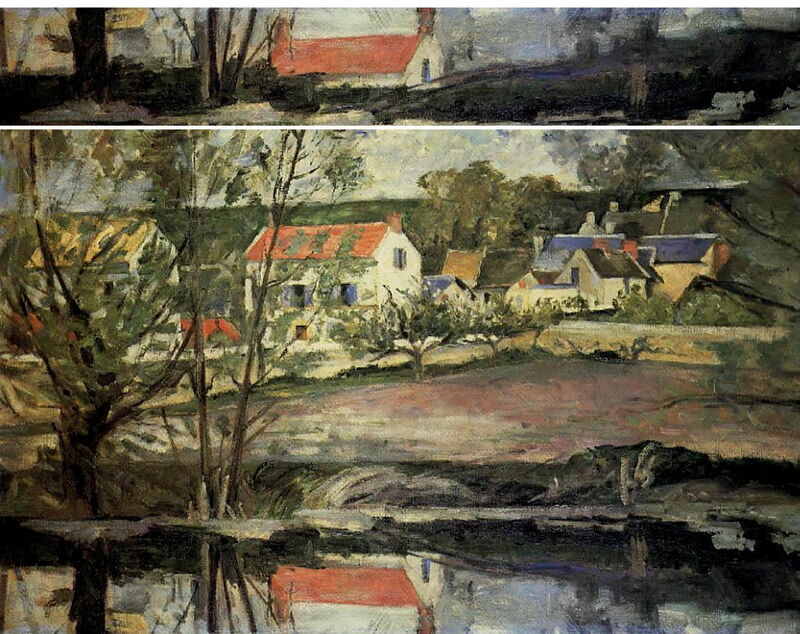 Assuming that the bank on which Cézanne placed his easel was about 3 m above water level, and his eye was about 1.5 m above that, basic trigonometry shows that the red roof of the house should also have been about 4.5 m above water level, which would not be compatible with the view as depicted. Problems with the reflections as shown become insurmountable when the position of the bank is taken into account. As painted, some of the reflection of the red roof is shown approximately the same distance from the top of the bank as the bank is vertically above the water’s surface. In other words, for the rays of light from the house to pass over the edge of the bank and be incident on the water as shown, their angle of incidence on the water would have to be greater than 45˚. The angle predicted from the estimates above is far below that, at less than 4˚. For the red roof to subtend an angle of reflection at the water surface of 45˚, it would have to be at the top of a slope of 45˚, which is clearly not the case either in the painting or in geographic reality. For the edge of the bank, about 3 m behind the reflection, to have been low enough to allow light rays from the red roof to be reflected where they are depicted, it would have had to have been no more than 20 cm above the level of the water. Therefore the reflections as shown cannot have been painted faithfully from nature, but must have been displaced from elsewhere or constructed from Cézanne’s imagination, possibly at a later time when no longer in front of the motif. Closer examination of the reflected image of the house with the red roof suggests another issue which merits further study of the painting. Cézanne appears to have made pentimenti to its left edge, at least, and possibly at its right edge too. Although without more extensive examination I can only speculate, it appears that an earlier attempt to paint the red roof may have shown it extending more to the left, where it would have been displaced less than it now appears. Paul Cézanne, Paysage des Bords de l’Oise (Landscape on the Banks of the Oise) (1873-4) (R224), oil on canvas, 73.5 x 93 cm, Palais Princier, Monaco. WikiArt. Composite image of detail, adjusted to align the original and reflected images. These can perhaps be seen more clearly in the composite image above, in which I have moved the reflected image to the left so that it does align ‘correctly’ with the real image. This also brings out other problems in the reflection, including the higher chroma in the red, the missing white gable ends and blue blinds on the window, and the excessive height of the chimney at the right end. To the right of the reflection there also appears to be some blue, which could have been an earlier depiction of the house to the right, which is set back even further than that with the red roof. Few if any cast shadows can be seen, the only possible ones being shown at the eaves of some roofs. In the case of the house with the red roof, these are also shown in the reflected image. 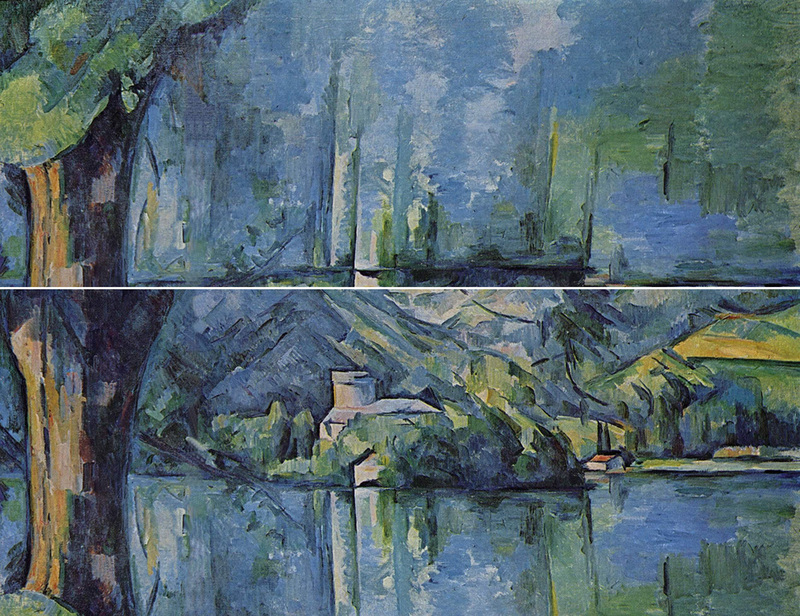 In summary, this painting shows gross lateral displacement of reflected images which could only have been moved from elsewhere or constructed from Cézanne’s imagination, and several discrepancies in the details shown in the reflected images. It is hard to explain these, particularly as this was at a time when Cézanne was often painting in company with Pissarro, whose long career included many paintings depicting complex reflections which adhered to optical principles. One possibility is that reflections were added later, when no longer in front of the motif, and primarily for compositional reasons. Examination of the paint layers of the reflection could provide useful evidence on this. Apparently rarely included in major public exhibitions, the problems in its reflections have recently been recognised by Denis Coutagne (2011), who wrote: “Curieusement, le paysage est traité de manière assourdie dans le plan d’eau. D’ailleurs, le reflet et la réalité ne se répondent pas vraiment.” (Curiously, the landscape is treated in a muted way in the water. Moreover, the reflection and reality do not correspond faithfully.) (p. 74.) He did not suggest an explanation for this lack of fidelity. Paul Cézanne, Le Bassin du Jas de Bouffan en Hiver (The Pond of the Jas de Bouffan in Winter) (1878) (R350), oil on canvas, 52.5 x 56 cm, Private collection. WikiArt. 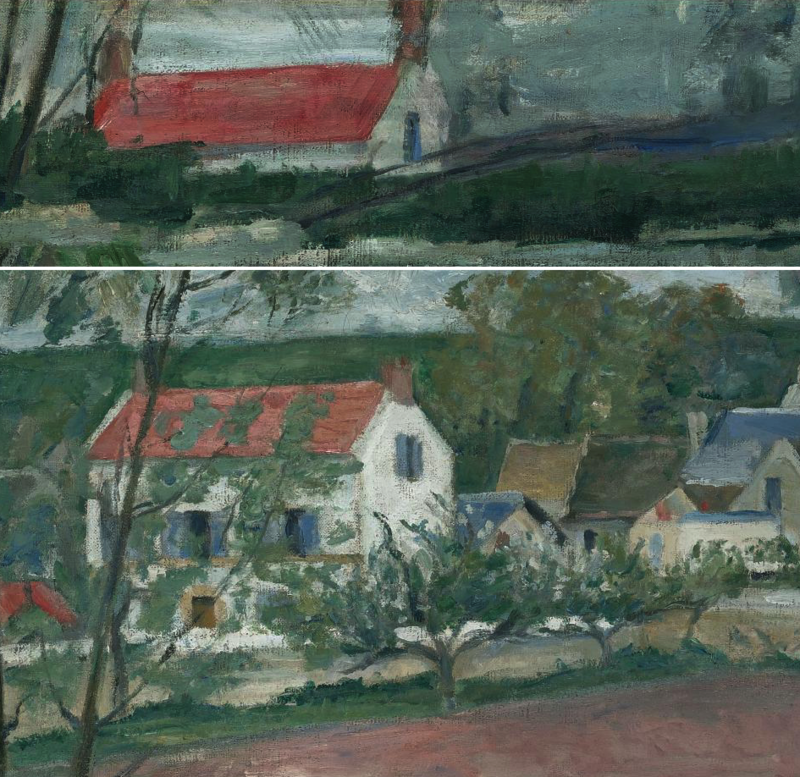 In this painting, a view which Cézanne must have seen almost every day that he went out from his family home of Jas de Bouffan, there are multiple discrepancies between the original and reflected areas, and evidence of pentimenti in the right side of the reflection. Looking over the pool, the painting’s midline is marked by a tree, behind which are various buildings. At the left, closest to the viewer, branches of an evergreen tree are seen in front of the nearest large building. From that a series of smaller sheds track across the middle of the painting, culminating in a wall. Behind those are a farmhouse, and a sloping field with light brown and green stripes. Cast shadows are shown sparingly around the central sheds, but not elsewhere, although the motif appears to be lit from the right. However the reflections shown bear little resemblance to the rest of the painting, with disparities obvious in every object seen in the reflections, and apparently large areas of pentimenti on the right side of the reflections. Lateral displacements in the reflections are, though, relatively small. Ten features were measured, eight of which showed displacements of up to 10 mm. These are seen in the composite view. Paul Cézanne, Le Bassin du Jas de Bouffan en Hiver (The Pond of the Jas de Bouffan in Winter) (1878) (R350), oil on canvas, 52.5 x 56 cm, Private collection. WikiArt. Composite image to show discrepancies in reflections. The highest section of building then has dark green marks on it which either represented windows which did not appear in the original, or arose perhaps from alteration of previous positioning of the evergreen branch. The adjoining shed immediately to its right is omitted from the reflection, as are all remaining structures running from it across to the right of the painting, although some, perhaps all, would have been expected to appear in the reflected image. Instead, Cézanne puts objects from much further back into the reflection. First are dark vertical strokes which look like the palings of a fence, which does not appear at all in the original image above. These can only represent a bare tree which is shown behind the shed. He then shows a simplified reflection of the distant farmhouse. This lacks its single-storey lean-to extension, has two windows and a door which differ in the reflection in both placement and form, a red roof which has a different outline and colour in reflection, and the prominent chimney at the right of the house is also omitted. The reflection of the prominent tree forming a central vertical midline to the painting does not follow the form of the real image, with a marked ‘S’ bend visible in the original, shown only on the right side of its reflection, too close to its base. Paul Cézanne, Le Bassin du Jas de Bouffan en Hiver (The Pond of the Jas de Bouffan in Winter) (detail) (1878) (R350), oil on canvas, 52.5 x 56 cm, Private collection. WikiArt. To the right of this, the reflection shows the right end of the distant farmhouse, then a large area in which there appear to have been extensive pentimenti, leaving no clear forms or objects depicted. Faint dark marks could have been intended to represent three bare trees shown on the sloping field above, but they appear too far back and placed differently. Neither do they match any structures shown in the closer buildings or wall. The only objects which they appear to correspond with are the door and windows of the farmhouse, on the opposite side of the painting. More recent photographs show a similar view, although it is claimed that Cézanne painted from a slightly elevated point on the top of a building. That could not account, though, for the completely different reflections seen in the photographs. Unfortunately the distant farm has since been demolished, so its precise position is no longer visible on modern satellite imagery. However estimates from satellite images confirm that the distant farmhouse would not have been visible in the reflections. Assuming that Cézanne painted this when he was 4.5 metres above the water level in the pool, and about 10 metres from the reflections at the end of the pool, if the farmhouse was 100 metres distant from the end of the pool, it would have had to have been 45 metres above the water level of the pool to appear in the reflections. The further back the farmhouse was from that position, the greater its elevation would have had to have been. 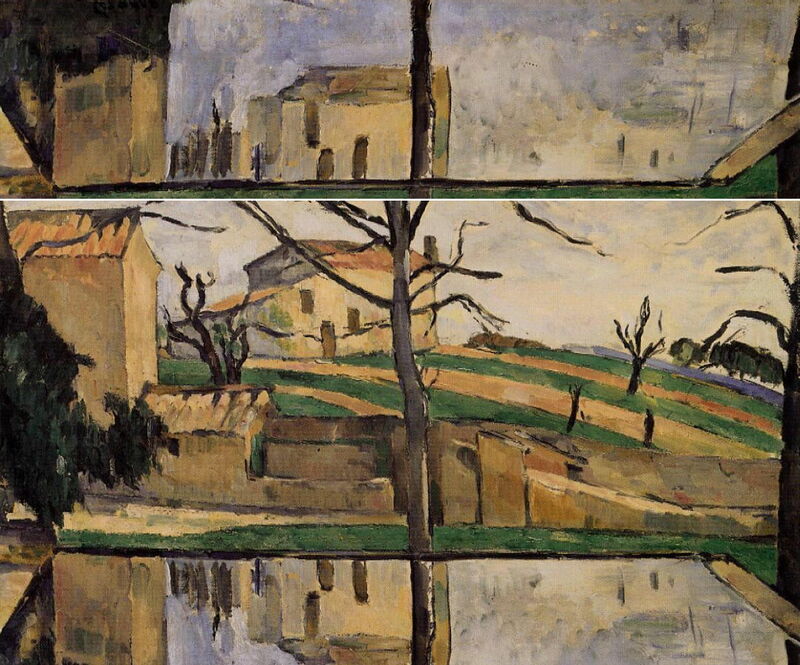 Cézanne therefore seems to have made a decision to omit the much more likely reflections of the nearer outhouses and wall, and instead to have added the optically impossible reflection of the distant farmhouse. Once again, without knowing more about the making of this painting it is impossible to know what these reflections represent. 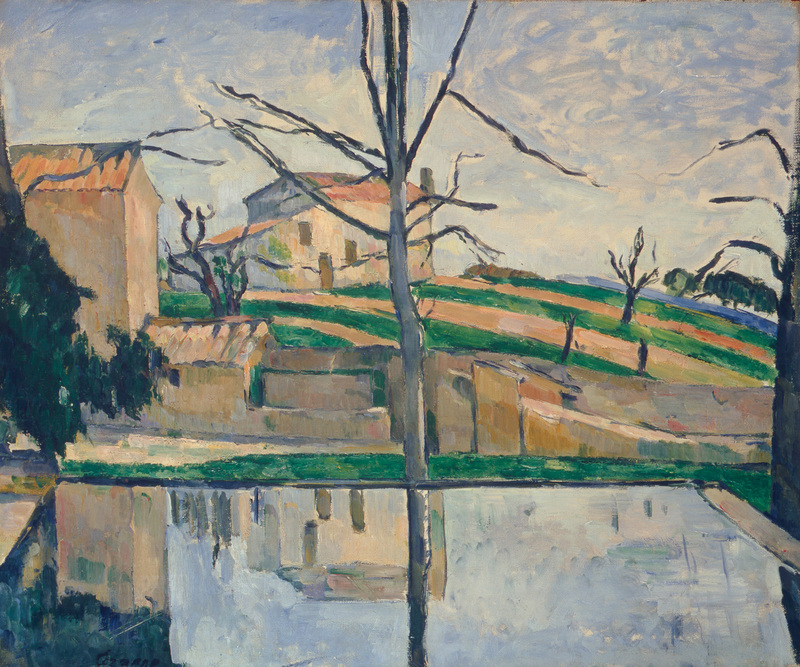 One possible explanation is that Cézanne tried using a technique sometimes recommended for painting reflections, rotating the canvas by 180˚, and inadvertently as a result painted the reflection of the farmhouse on the wrong side of the pool. On restoring the orientation of the canvas, he then tried to correct the reflection, but did not complete its detail. However this does not explain why he painted the distant farmhouse in reflection in the first place. He does not offer any description or interpretation of the “metaphor” he claims lies in the reflection, nor how this represents a path being travelled by Cézanne which diverged from that of the other Impressionists of the time. Thus Coutagne’s comments are as paradoxical as Cézanne’s depiction of the reflections. Had Cézanne intended such a contrast between the left and right sides of the picture, that would have been as well served, possibly better, if the reflections on the left side had contained those of the outhouses rather than the distant farmhouse. Neither an unspecified metaphor nor compositional contrast seem to fit the painting completely. I have examined electronic images of 27 oil paintings and 4 watercolours by Cézanne, in which there is sufficient detail of reflections on water for such analysis. These span the period 1860 to 1904. In the next article, I will show you some other interesting paintings, and speculate as to what is going on with them.